Marie Rouensa, aka Aramepinchone – daughter of Mamenthouensa, Chief of the Illiniwek Confederation – might have lived and faded into utter obscurity had it not been for her conversion to the Catholic faith and her subsequent role in the church and the community of Kaskaskia. Over the course of her lifetime, she not only served as the vehicle for the conversion of others to the Catholic faith, but she also accumulated significant wealth, status, and power, which she subsequently left to her offspring. At that early time, women, particularly Indian women, were important contributors to a family’s financial success, and race didn’t seem to matter as much as connections. Marie had no difficulty finding French husbands (she married twice), and her descendants were well received at every level of society – two of her granddaughters married aristocratic officers from France and Switzerland. Marie’s conversion to Catholicism set in motion a sequence of conversions that laid the basis for the founding of the Franco-Indian settlement of Kaskaskia in 1703, a momentous event in early Illinois history. 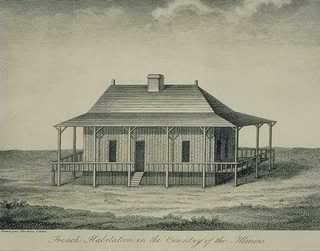 The conversion of those important members of the Kaskaskia tribe also set in motion an important French policy in North America – making tribes dependent upon the French. 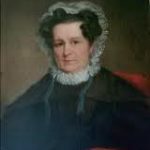 Although strong-willed, Marie made the leap between Indian culture and French colonial culture and led what seems to have been a successful and apparently fulfilling life as a wife to Frenchmen and a mother to their children. Devotion to the Roman Catholic faith as it was conveyed to her by French Jesuit priests seems to have been a central element in Marie’s life from the time of her conversion in 1694 to the moment of her death. In 1673, French explorers, Louis Joliet and Pere Marguette, began the journey that would memorialize them for centuries to come. They began their journey south and west of Lake Michigan, in search of a route to the Gulf of California. Along the way they were warned by Indians not to go any farther south, as in the “great waters”, meaning the Mississippi River, because there were fish so large they could tip the canoe and eat them alive! Also, there were fierce tribes who lived along those shores, and they would surely be captured and tortured. The men ignored the natives, and proof of the Indian warnings soon followed. Marguette recorded an incident of a giant fish nearly tipping the canoe. After a time, the explorers realized they weren’t going to find the Gulf of California on the Great River, and it was taking them into hostile Spanish territory. They turned around and began the journey back home, returning by way of the Illinois River. It was along this river, near present day Utica, they found a peaceful tribe who called themselves the Kaskaskia. The men stayed for awhile and rested among the Kaskaskia, becoming friends with them. Marquette was in bad health and had to return to Canada, but promised them he would return. This he did, and founded the Mission of the Immaculate Conception. When his health worsened, Marquette began the journey back to Canada. He died along the way at the age of thirty-eight. Across the Illinois River from Fort St. Louis lay the village where Marie Rouensa was born in the late 1670s, sometime before the village was ravaged by the Iroquois in 1680. Her life began in violent, chaotic times. 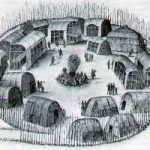 Pressure from the Fox and Iroquois tribes — in addition to lack of firewood, game, and adequate water — encouraged the French and their Indian allies to begin a southward migration in 1691, eventually resulting in the founding of the village of Kaskaskia. One of the first settlers in Kaskaskia was Michael Accault, or Aco, as it was later spelled, who had come to Illinois in 1679 with La Salle. A coureur du bois – an individual who engaged in the fur trade without permission from the French authorities – Aco was also adept at Indian languages. 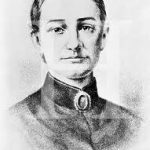 The chief of the Kaskaskia offered his daughter Marie to Aco for a wife. Aco accepted, but seventeen-year-old Marie had other plans. But compromises and concessions were made, and Marie and Michael Aco married. Their son, Pierre, was born in March, 1695. Michael, the second son, was baptized February 22, 1702. One of the boys, probably Pierre, was sent to Canada by the Jesuits to be educated. Michael, while still a youth, returned to live in the wilderness with his mother’s tribe. Aco died sometime prior to 1703, and Marie married Michel Philippe, later captain of the militia and one of the principal citizens of the town, but then only another trader. The marriage between Michel Philippe and Marie Rouensa produced at least 7 children. Their firstborn, Jacques, baptized in 1704, and their other five children married into several families, so that in later days, not a few of the habitants traced their lineage to the daughter of the chief of the Kaskaskia. For the next twenty years, the only documents pertaining to the marriage and household of Marie and Philippe are the records of their children’s baptisms by the various Jesuits who served as missionaries. Later in the century, Kaskaskia became a flourishing French village filled with rows of low one-story French-style houses lining the streets. These unique native and French bonds had begun when explorers Louis Joliet and Pierre Marquette discovered the peaceful Kaskaskia tribe, while journeying along the Illinois River. 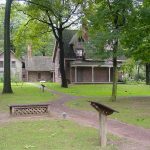 Marie continued throughout her life to help the Jesuits in their work, and when she died on June 25, 1725, she was buried beneath her pew in the parish church, the only woman in Kaskaskia’s history to be so honored. Her burial record states that at the time of her death at Kaskaskia in 1725 she was “about forty-five years old.” Her eight children ranged in age from 4 years old to 28 years old. Marie Rouensa Aco Philippe’s life was so significant that Duke University included her in their seminars on women who helped to shape the nation in 1999, Ohio University teaches a history course based on her life, and the Illinois State Museum has an entire wing dedicated to her and her tribe.